Damn Arbor: What is LLTM? 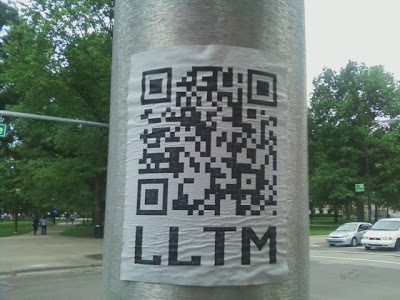 I've spotted these QR code posters around town and also several stencils of LLTM in block letters. What does it all mean? Low Land Tiger Meet? Linear Logistic Test Model? Long Lead Time Material? Laughing Loudly to Myself? Lithia Loop Trail Marathon? Living Light Tabernacle Ministries? I think it means I need to get a smartphone. UPDATE: According to @trevorstaples, the QR code above takes you to the Pangea Piercing blog. @juliewbee speculates LLTM stands for Long Live the Mastafish. Mystery solved. Good work team!